Albert van der Sel : Quick introduction SSRS. For who	: For anyone who likes to start using SSRS. But it is so "super simple", that it can only be effective for true starters. Note : Refresh your browser to see updates. 5. A few remarks about the Security involved with Reports and SSRS. SSRS is actually a "framework" with a number of components. Let's first take a look at SSRS of SQL 2008. As a very logical introduction, you might picture a SQL Server database, and a certain "query" that delivers interesting information to endusers. Now, working directly with TSQL is not really "great" for true endusers. Also, performance (and security) might be at risk as well. A solution is SSRS. The SSRS framework provides for services, interfaces, representations of datasources, and a "Development Studio"
where it can simply be accessed by endusers using a webinterface. Although SQL Server tables are the most logical foundation for datasources, you can choose others as well, like Oracle, or XML etc.. Thanks to the framework, the DBA can deploy reports, and also perform administrative tasks on them. is a "Development Environment" called "Business Intelligence Development Studio" (BIDS). With BIDS, you could create relatively simple Reports and deploy them, but you could also perform more complicated stuff. 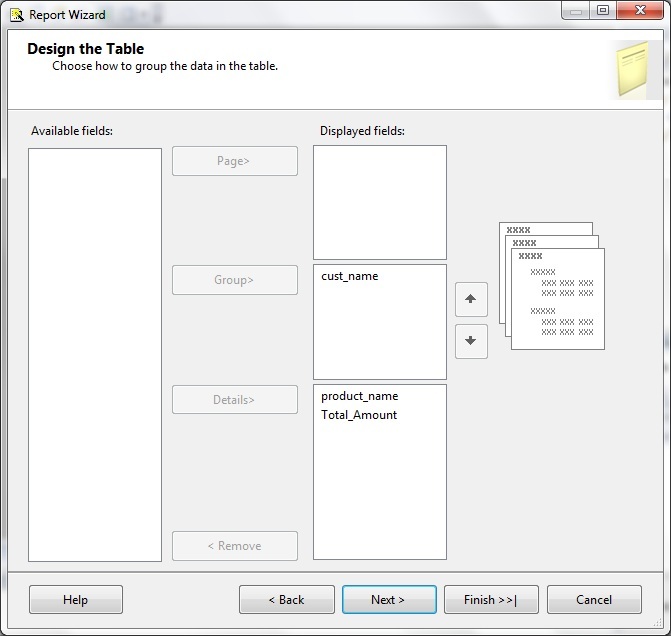 into SQL Server tables first, and when that is done, generate a report on that data. This can all be arranged from BIDS. It means that you can create "tasks" and workflows, which, when completed, in the end generates a "report". It's a simple figure, but take notice of the different components. We will see them later on. Note that SSRS needs two SQL Server databases (ReportServer and ReportServerTEMPDB), to store reportdata as well as metadata. - In SSRS 2005, the Reporting Service was dependent on IIS (Internet Information Server). So, in 2005, IIS was a required feature for installing and running SSRS on a Node. thereby lifting the need for a full IIS installation. 2. A few remarks on installing and configuring SSRS. 2.1 A few remarks on installing SSRS. Installing SSRS is an optional part of SQL Server setup. Once your system have passed the "setup support rules" during the first stage of SQL Server setup, the installation is easy enough. But a few remarks are in order. During setup, you will see the screen above, as shown in figure 2. This screen shows you all the components you can install. the "Report Service" in the Instance Features Note that you do not need to install SQL Server (Database Engine) and SSRS on the same machine. So that's why you can select/deselect the checkboxes the it serves you best. Although in many case, a lot of folks will install the SQL Server service (Database Engine) and SSRS, on the same node. In this case, both checkboxes must be selected. Note from figure 1, that SSRS needs two SQL Server databases for data and metadata storage (ReportServer and ReportServerTEMPDB). on the local SQL Server instance. Then there is no further followup needed. After setup, you can start using SSRS right away. 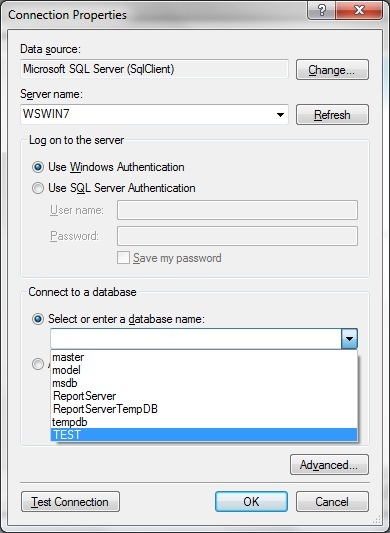 configuration afterwards (like selecting a local or remote SQL Server for storing the ReportServer databases). Also, make sure that you have selected the "Business Intelligence Development Studio" (BIDS) in the "shared features" section. 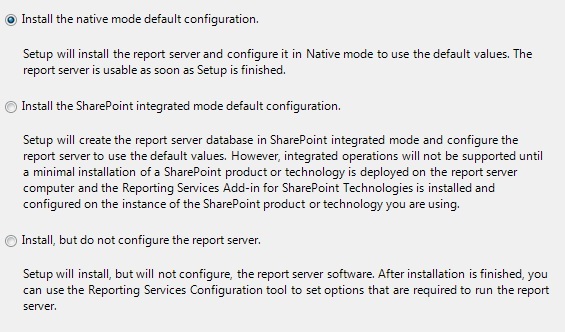 If so, you do not to change anything, and after setup has finished, you can immediately create and deploy reports. 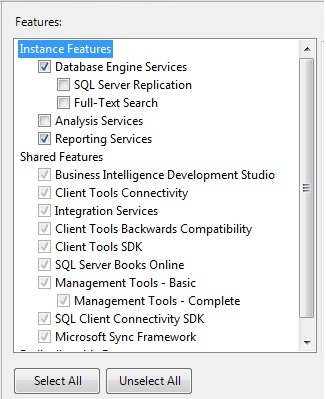 - If you install SSRS standallone (no SQL Server Database Engine on that same node), you must choose the third option. Then, the service and all supporting files will be in installed. local or remote SQL Server instance, to install the Reporting databases onto. - The second option (Sharepoint integration mode) might be used if you have the intention to integrate SSRS and Sharepoint. Afterwards, the Sharepoint Admin needs to use Central Administration to create a Reporting Services service application. Actually, during this process, three Reporting related databases will be created (instead of just two). However, in many cases, options 1 or 3, often apply. 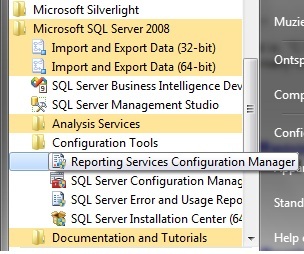 C:\sql2k8x64> setup /q /ACTION=install /FEATURES=SQL,RS,TOOLS /INSTANCENAME=MSSQLSERVER /SQLSYSADMINACCOUNTS="BUILTIN\ADMINISTRATORS"
One common way to configure SSRS, is to use the "Reporting Services Configuration Manager". From the "SQL Server 2008" program group in the Windows startmenu, you can locate this tool in the "configuration" folder. Note: On my Server, the exe to this the tool is: "C:\Program Files (x86)\Microsoft SQL Server\100\Tools\Binn\RSConfigTool.exe"
If we start it, we see that there are indeed many configurable items that we can initiate from this tool. In the example below, I have selected the "Databases" catagory in the left pane. This could have been a valid option, if I had installed SSRS with "files only", using the third option (as shown in figure 3). 3. Creating and Deploying a Report using BIDS. then I am quite sure you are going to like this. shown below, and insert the datarecords. The reason is, that we need some sample data to create reports on. It's a silly datamodel, but we just need some testdata. 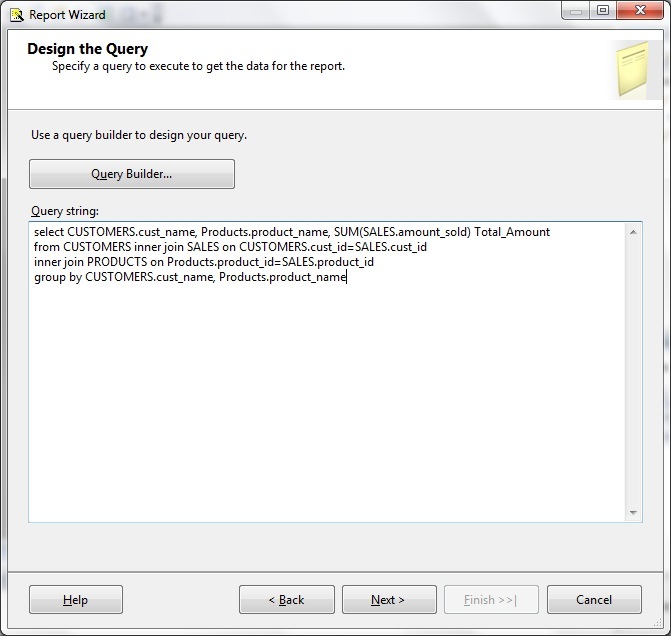 You can simply copy/paste the sql below in a Query Window. Before we make reports, I created a folder "C:\testreports" to hold all my new sources. Maybe you should do the same. Now that all preparations are done, let's start creating a Report. In your Windows SQL Server program group, locate the "SQL Server Business Intelligence Development Studio", and start it up. Since we are going to create a new report, click on "File", click "New", and choose "Project"
Fig 6. Choosing for "Business Intelligence Projects"
Now watch the above dialogbox closely. Here, in the leftpane, we can choose for "Business Intelligence Projects" and "Other Projects Types"
Let's first try "Business Intelligence Projects". 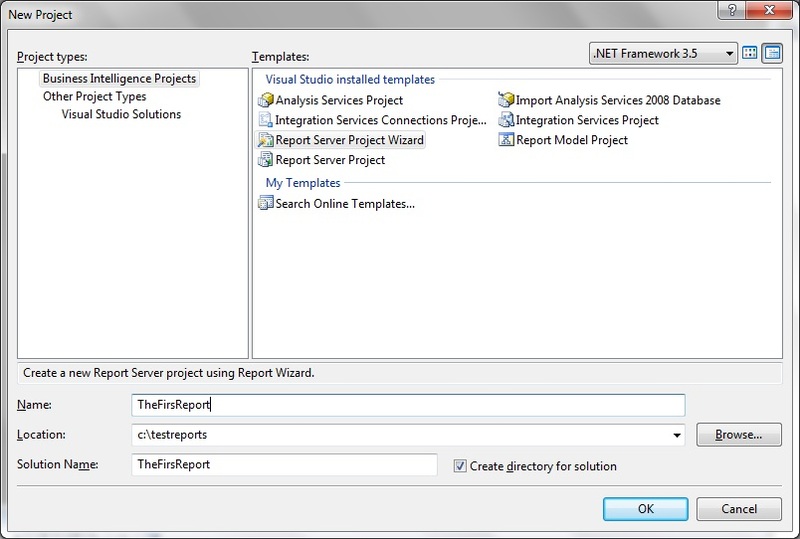 In the rightpane we can choose for "Report Server Project Wizard"
Both will lead to screens in order to create a Report, but the Wizard helps tremendously if you are new. Now you could fill in "name" (TheFirstReport) and "location" (c:\testreports), and we could start. But I want you to start a bit differently. 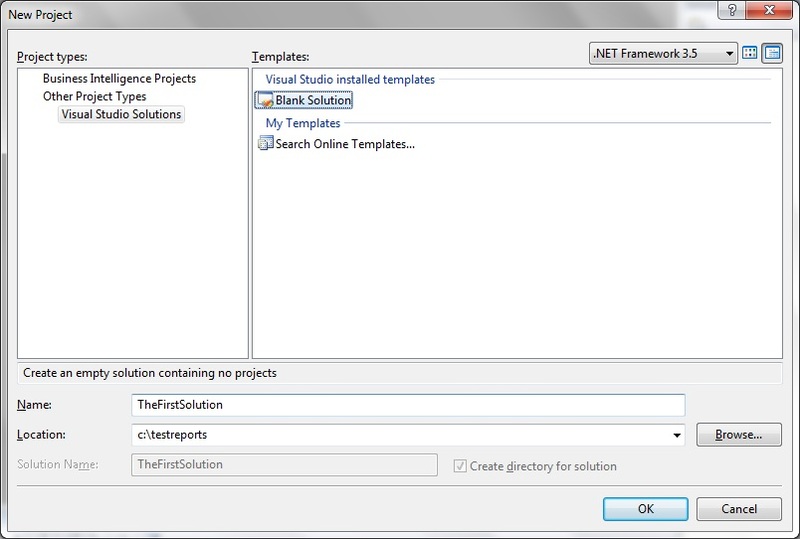 Instead, in the leftpane, choose "Other Project Types" and then choose "Visual Studio Solution", and choose "Blank Solution". Fig 7. Choosing for "Solution"
there meaning in BIDS are very close (or almost identical). However, generally, a "solution" is a bit "wider" concept. Anyway, for our goal to create reports we can choose the way like shown in fig 6, or like in fig. 7. After you have typed in the above, confirm your choice and click "OK". At the right side of BITS, you will see the "Solution Explorer". 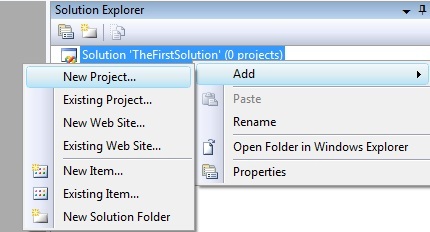 Here it will show "Solution 'TheFirstSolution' (0 projects)"
Were gonna add a Project to our solution, so rightclick your solution and choose "Add" and choose "New Project". Fig 8. Adding a Project to our "Solution"
Fig 9. 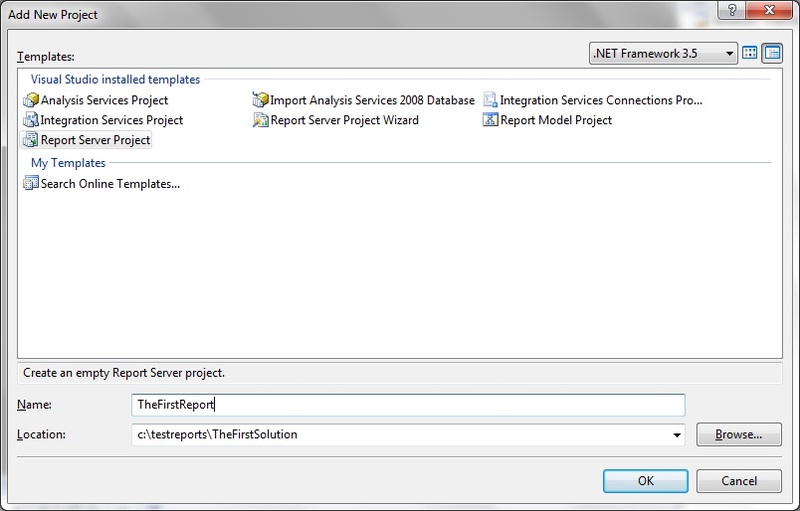 Adding a Project to our "Solution"
Fill in the Projectname as shown above (TheFirstReport) and click OK. Fig 10. 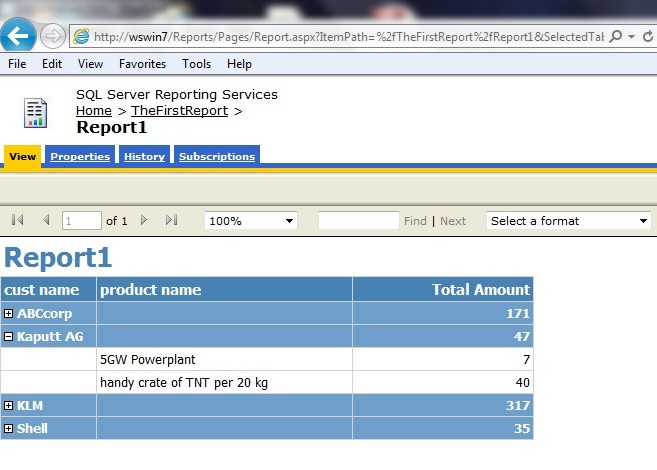 Solution Explorer showing "SharedDataSources" and "Reports". I already rightclicked on DataSources. or TerraData, XML etc.., and ofcourse a SQL Server database as well. So, rightclick the "Shared Data Sources" container, and choose "Add New Data Source". Fig 11. Shared Data Source Properties. Give the Data Source an appropriate name. I named it "SQLServerTESTDB". In order to create a "connection string" (on how the report will access the database), click "Edit". 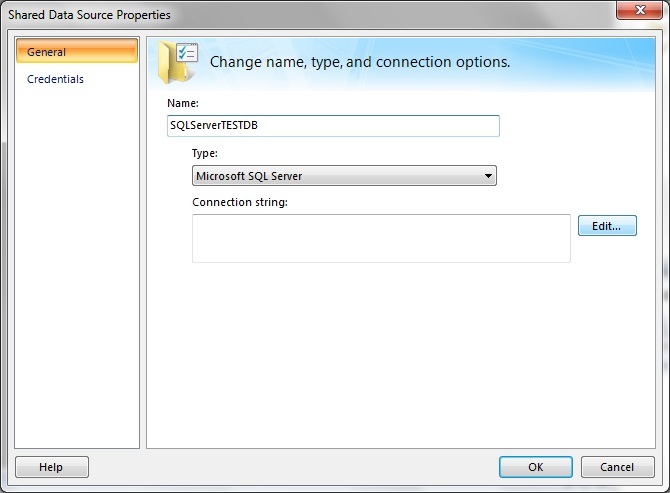 Select the desired SQL Server Instance name, and after that, select the desired Database name. In my case, the instance is called "WSWIN7", and the database containing the sample data is "TEST". Click OK to return to the former Dialogbox. Take notice of the "connection string". Apparently, a Database is called a "Catalog". Confirm this Dialogbox too, and in the Solution Explorer you will see your Data Source listed as "SQLServerTESTDB.rds". Here, we take the Wizard, so choose "Add New Report". The "Welcome To The Report Wizard" screen pops up. Click Next. In the Dialogbox that follows (not shown here), you can either select an existing DataSource, or create a new one. Since we already have the correct DataSource, we only need to to click "Next". to select an existing DataSource, or create a new one. I simply added a Query as shown in the figure below. After that, a few dialogboxes will follow with respect to the "formatting" of the Report. I think that this is not so very important for this note. However, one of those screens is shown below. of SQL queries might help (like how to group data). "Enable Drill Down" and "Include Subtotals". I would like you to enable those. Take a good look at that screen. On the right is the Solution Explorer, showing the objects that you have created sofar. In the middle we have your Report in two possible modes (note the tabs): Design and Preview. If you switch to "Preview" mode, the report will be build and you will see what your endusers will see as well. In "Design" mode, you can still alter details of your report (like for example widening a column). Since I stored everything in C:\testreports, let's see what we have in there. -There is a .sln file, which describes versions of the "solution"
In BIDS, in the Solution Explorer, you can rightclick Report1, and choose "View Code" which shows you the XML. Now we need to deploy the report on the Reporting Services, so that endusers may access it using a browser. Don't forget: BIDS is a client tool, so maybe you have developed the report on your Workstation. When we deploy, the ReportServer database receives the neccessary information about the DataSource, Report etc..
so that this information is centrally accessible. If you take a look at the figure below, then you see how you can deploy your solution. But hold on: BIDS first need some info from you like the Server URL. So before you take action like is suggested in figure 17, rightclick your solution and choose "Properties". In figure 18 you see an example of those properties and values. Take a good look at those properties. The server URL, in my case "http://wswin7/reportserver" is essential. When all properties are set, perform the action as is suggested in figure 17.
then you might receive an error on "insufficient permissions", even if you were logged on as an Administrative user. In this case, startup BIDS again, but this time using the "run as Administrator" (rightclick the icon). As shown above, I can click the "TheFirstReport", and from there I am able to really active the report with data. 4. 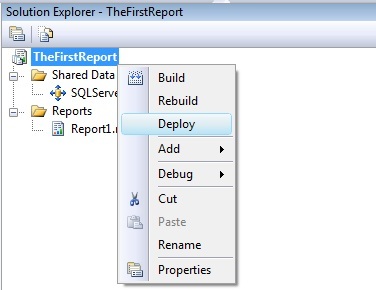 Some other ways to Create and Deploy a Report. that you keep (for example) DataSource names consistent accross all environments. for deploying reports from Test to Acceptance to Production. Never underestimate this: it requires carefull planning and probably quite some research. This is what we already have seen in the above section. 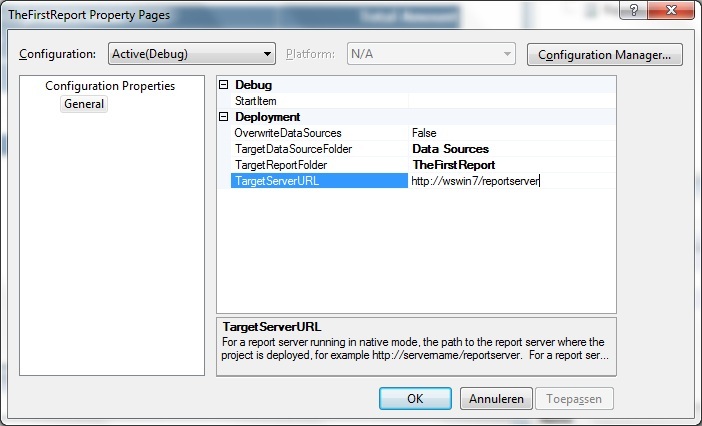 You can deploy reports using the "rs.exe" command utility. You can easily check the internet for the full syntax of "rs" and examples of deployment. Here you will find controls to upload a file. 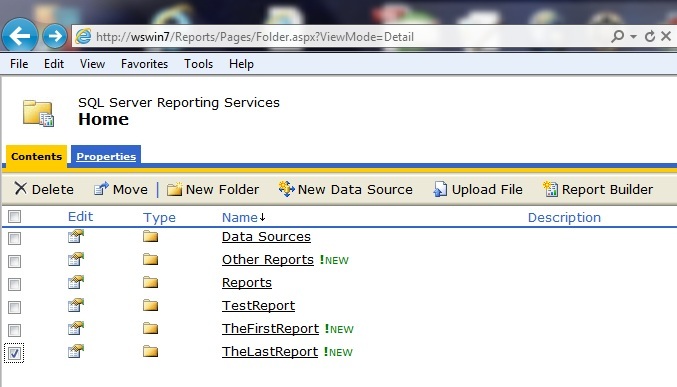 To upload a report, browse to a report definition (.rdl) file. 5. Security involved with Reports and SSRS. Here are a few words on managing security around published Reports. SSRS 2008 does not use Internet Information Server (IIS) to "host" the folders as "virtual directories". SSRS sort of hosts them itself using http.sys and database information (as we shall see later). This somewhat complicates "good" management of virtual directories. As we know we can connect to the folders and modify the permissions using the Report manager. What type of "permissions"
you can "grant" to Domain groups (or users), are determined by the implicit "roles" within the Report Services itself. This will be explained now. is in place with the Report Service engine. and "Report Services" as well. In the figure below, I connected to my Report Server (using SSMS) and viewed which roles exists. of "permitted tasks" aka permissions. I doubleclicked the Content Manager role, which role may perform just about any task as you can see from figure 22. By the way, it's possible to select/deselect a certain task (permission) in order to "lower" or "increase"
Note that it's easy to create a custom role. Just rightclick the Roles container and choose "Add Role"
As you can see in the figure above, I created the role "ThisRoleWasCreatedByAlbert" which may only view reports. to "edit" the security of the "TheLastReport" folder. So, select that folder and click edit. So, I pursued my action, and tried to alter the "permissions" with respect to "TheLastReport". As you can see, I can grant the group "Antapex\nerds" the role "ThisRoleWasCreatedByAlbert" to view reports. In the ReportServer database, a number of tables exists which form "the registry" around SSRS. So, multiple SSRS implementations in native mode, will never form an Enterprise System. 6. A note on SSRS and High Availability. like Database Mirroring or Failover Clustering. But the SSRS instance itself, is not cluster aware and cannot failover, even if you install SSRS on two Failover clusternodes. However, you might consider a SSRS scale-out deployment to run in a "Network Load Balancing cluster" (NLB). This means that a "Load Balancer" "connects" to two (or more) SSRS instances, which uses a shared Reporting Database. 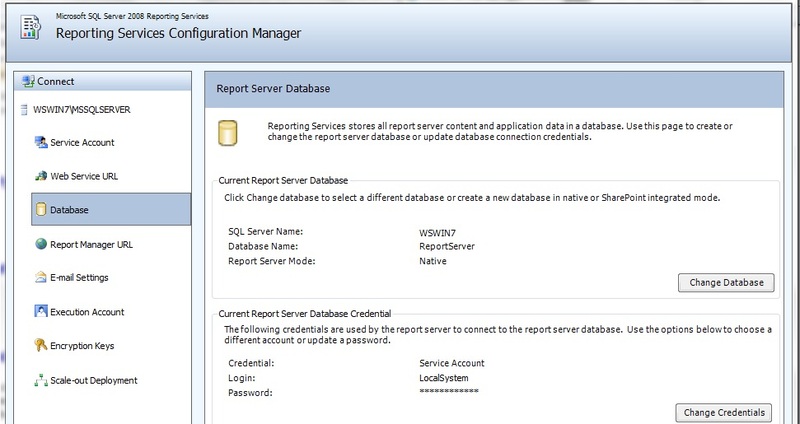 This Reporting database then, can just be part of a SQL Server Failover cluster. just ar part of standard Failover clustering. and configured on the Servers where the SSRS instances are going to be installed. So, the NLB cluster is accessible through a virtual server name that "maps" to the virtual server IP address (in DNS). A virtual server name is needed so that you can configure a single point of entry to the NLB cluster. The NLB cluster then will adress the balancing between the "real SSRS nodes". When configuring a URL for each report server instance, you will specify the virtual server name as the host.